Kindara is one of a handful of startups that have turned their attention to women’s health, especially fertility tracking, family planning, and pregnancy. It’s a competitive area with some well-known—and better-financed—rivals such as Glow and Ovuline. But since launching its fertility app in 2012, Kindara has established itself as a successful startup. 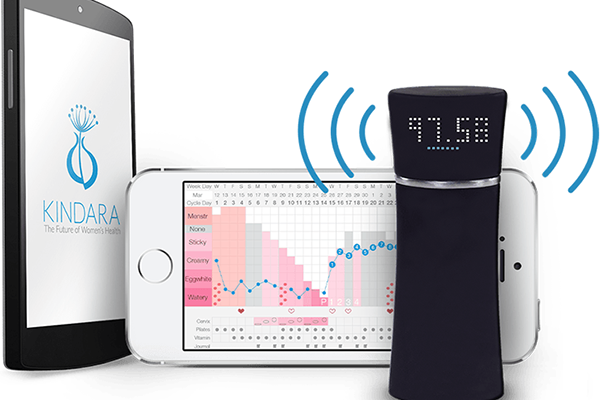 Kindara says that through September, more than 500,000 women have used its app, either as a way to help conceive, as a natural way to prevent pregnancy, or to track their ovulation cycles and other health conditions. Since 2012, about 35,000 women have used it to become pregnant, the company says. Co-founder and CEO Will Sacks said now the company is poised to make a big leap. Wink is the most obvious indicator, but the company also has raised $1.25 million from SOS Ventures, Vast Ventures, Drummond Road Capital, and angel investors. The money will allow Kindara to market and sell Wink and add staff. Sacks co-founded Kindara with Kati Bicknell, who is his wife. They were looking for the family planning method best for them when they learned about what’s known as the fertility awareness method. Fertility tracking is a way for women to understand when they have the greatest chance of becoming pregnant. Generally, there’s about a six-day window when a woman and her partner can conceive. For women trying to conceive, knowing when that window opens is a common way for them to improve the odds and have a greater measure of control. It’s also helpful for women trying to avoid pregnancy, and when done right is a reliable, natural contraception method free of the side effects hormonal birth control pills create, Sacks said. The method requires women to take their temperatures immediately after waking in the morning—ideally before getting out of bed. It works because their basal body temperature rises and falls during their cycles. Women also track the viscosity of their cervical fluid. Both are indicators of impending ovulation. For years, women using this method have had to make those observations and write them down in calendars or journals. It’s the kind of data collection and analysis that an app can easily manage, Sacks said. The popularity of Kindara’s app seems to validate his claims. Now, Kindara is trying to make it even easier with Wink. The thermometer removes “a tiny, annoying step” of data entry, Sacks said, saving women a little time and helping them get better results. There are other thermometers out there that connect to smartphones, like Kinsa, but Sacks thinks connected devices like FitBit have shown the real advantage comes from a powerful device connecting to a well-designed, purpose-built app. “When you knit together the hardware and the software into one easy experience, it becomes so much more,” Sacks said. Kindara always has had its eye on developing hardware, specifically a thermometer like Wink, but also other devices that track women’s health. The company was among the first graduates of the Haxlr8r startup accelerator in Shenzen, China. The area around Shenzen is sometimes called “the Silicon Valley of hardware,” and the accelerator is only for startups developing hardware technology. Sacks said Kindara has long-term plans for other devices after Wink is established in the market. Currently, Kindara is taking pre-orders for Wink at a discounted price of $79. Orders are expected to ship in the spring, Sacks said, and the retail price will go up to $129. Wink is the beginning of an overall strategy to become one of the leading digital healthcare companies that’s focused on women’s health by building sophisticated but easy-to-use connected devices, he said. The market for digital health still is in its infancy, but there are startups that are making gains and will soon be competitors. Glow has raised $23 million, including a $17 million Series B round announced earlier this month, and has backing from Andreessen Horowitz and the Founders Fund. PayPal co-founder Max Levchin is Glow’s executive chairman. Ovuline is another women’s health startup that has received press attention. It has raised about $2.75 million from investors, including David Cohen’s Bullet Time Ventures, and it is a Techstars graduate. There’s also a German startup named Clue that is developing fertility-tracking apps. The competition doesn’t faze Sacks. In some ways, it’s kind of the opposite. It doesn’t hurt that publicly released usage stats show Kindara is holding its own. Ovuline’s website says it has helped 250,000 women and that its users get pregnant three times faster than the national average (there’s no specific number of conceptions mentioned), while Glow said through August, it had helped more than 20,000 women conceive. Kindara cites estimates that say $26 billion is spent annually on women’s healthcare, with $6 billion going toward getting pregnant and $10 billion on avoiding pregnancy. That means fertility and women’s health are big enough markets that there should be room for multiple companies to be successful, Sacks said. “We’re all going after the same customer, but are all taking significantly different approaches. There’s probably room for more than one of us to win,” Sacks said. Glow and Ovuline emphasize their “big data” capabilities, which they say gives them the ability to help women predict their ideal time of conception. They also are introducing additional apps that women, their partners, and their doctors can use throughout their pregnancies. Kindara says it is focusing on user experience, including features that allow women to share data with friends and their doctors. “If we build really beautiful experiences for our customers, and keep our customers happy, I think we’re going to keep growing and good things will happen,” Sacks said. Very accurate description of the product and the company! Kindara seems to start a big business! Good luck to all who want to take control of your fertility!